The Bournemouth Bloggers events became quite frequent over the past couple of months. We were averaging an event a week, and it has been a bit of a whirlwind lately. One of the most recent events, a visit to the Bournemouth branch of Mexigo, was one I was really looking forward to as I am a big fan of Mexican food. The event was a little different as it was organised through myself but on behalf of the lovely Darren from Darren Northeast PR. Mexigo is a burrito bar, specialising in fresh, locally sourced ingredients offered in a fast food environment, allowing you to eat in or take away. The set-up is similar to Subway, in that you follow the counter along, personalising your order with options such as rice, salsas and beans, and a selection of optional extras. As well as burritos, you can choose from a range of fajitas, quesadillas, tacos, nachos and bowls. There’s also the option to make it a meal, with a side of nachos, a dip and a can of soft drink or bottle of water. Mexigo is suitable for all, with a menu which offers both vegetarian and vegan options, a separate children’s menu, as well as catering for gluten free and low calorie diets. We headed over to meet Darren and the team in the Bournemouth branch last Wednesday evening and, from the start, I was blown away by how welcoming and accommodating everyone was. We were welcomed with a smile and the offer of a drink by the lovely Lynne, before being shown to our reserved area of the bright and colourful restaurant. It was a sunny, light evening, with the patio style doors opened up onto the street, and the whole event was very relaxed and informal, allowing us all to catch up and enjoy ourselves whilst tasting the mouthwatering food on offer. 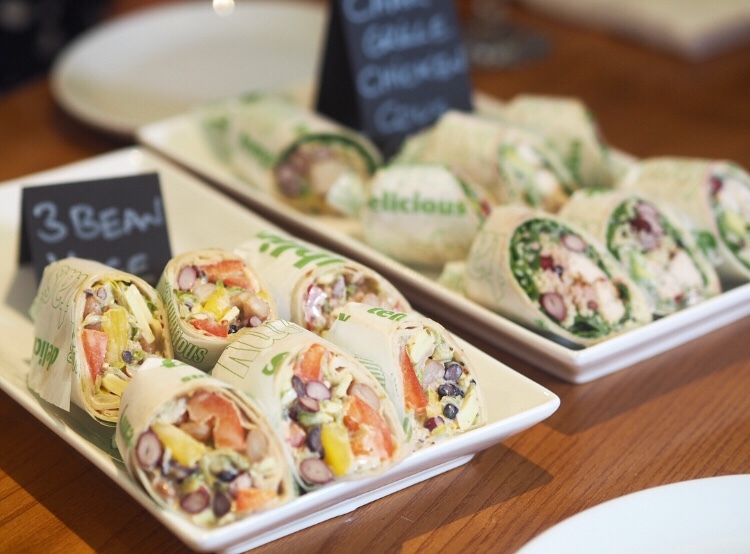 We were provided with a selection of wraps, which we were told would soon be launched, aimed at those looking for business lunch options. There were a few varieties on offer, and I was surprised to find my favourite was the vegetarian chilli burrito (although I did also enjoy the shredded beef). A few of the other meat eaters also liked the vegan option the best! Next up was nachos, by far my favourite side when it comes to Mexican food, and clearly popular with everyone else as well as these went super fast! Alongside the food, we also got to sample the delicious frozen cocktails, which were a bit like adult slush puppies. I had the frozen strawberry daiquiri and it was so yummy! As well as iced drinks, they also offer a range of other alcoholic beverages including wine, martinis, margaritas, various spirits and bottles of lager and cider, as well as a huge variety of soft drinks. If you are still hungry after your meal, there is a well stocked Ben & Jerry’s fridge, which I clocked as soon as I walked in the door! Mexigo is open from midday until 10.30pm throughout the week, and until 11pm on Saturdays, and is located in the Landsdowne area of Bournemouth. I was invited along to sample the menu at Mexico with Darren Northeast PR & the Bournemouth Bloggers, but I was under no obligation to write about our visit, and all words and images are my own.